Christmas and New Year are fast approaching which means all the parties you said you would go to in November are suddenly here and you realise you may have over-estimated your ability to socialise three nights in a row. Or is that just me? Anyway, the end of year parties are a chance to have fun with the beauty trends we have seen this year, and here are some of the best. Metallic: Metallic clothing was a huge thing this year, and this party season it’s translated to make-up. Go for an updated version of the smoky eyes with shades of silver, gold, platinum and bronze to create instant glamour. For a more subtle look, go for a silver pigment in the inner corner of the eye, or go all out and create a liquid-metal, wet-look effect across the whole eye. Hair accessories: Hair accessories have taken a turn for the sophisticated this year which means a hair accessory won’t be out of place at a party. 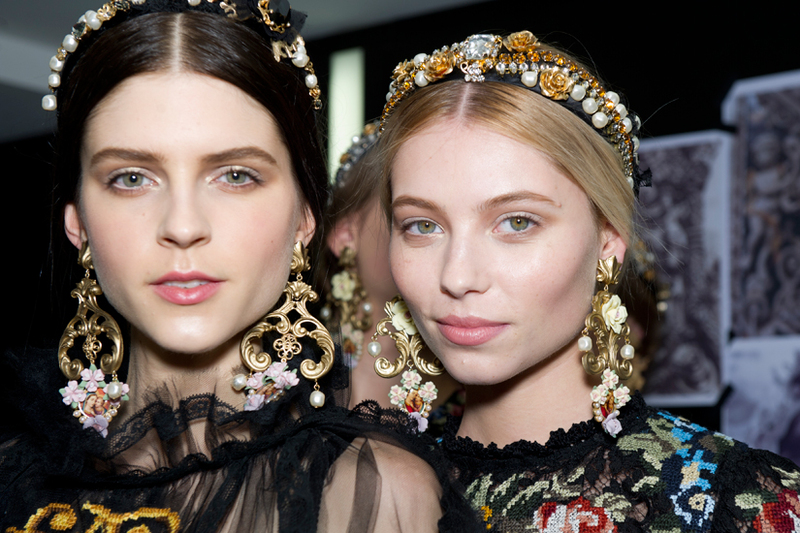 Dolce & Gabbana are leading the way with their jewelled hair grips and headbands, suiting either an up-do or just as a way to dress up your usual look. Strobing: The game changer. The new kid on the block. Strobing is the latest make-up trend ready to take over contouring. Brands have started releasing an abundance of products that highlight and illuminate for glowing radiant skin. Strobing focuses on creating a slim-line face shape and will be all the rage in 2016, so you might as well get in early. Bold lips: The easiest way to go from daytime to evening is by putting on a nice bold lipstick. Dark colours have been huge this season, though don’t be afraid to go lighter. Up-dos: The up-do is always fail-safe, and this season it’s the wispy up-do that is perfect for the party season. It gives a soft, feminine touch to the messy bun and also means you can wear statement earrings. Eyeliner: For the more daring of us, eyeliner has been the subject of a lot of playing around this year, with graphic eyeliner dominating the catwalks. From cat-eye flicks to think, above the lid strokes, it’s definitely not for the faint-hearted…or wobbly handed.